A Companion to Genethics is the first substantial study of the multifaceted dimensions of the genetic revolution and its philosophical, ethical, social and political significance. 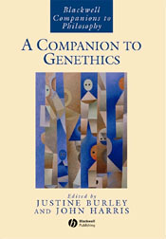 Brings together the best and most influential writing about the ethics of genetics. Includes newly-commissioned essays, all written by prominent figures in the field. Shows how there is scarcely a part of our lives left unaffected by the impact of the new genetics.